To celebrate part 30 of my youtube countdown, I present you something truly wonderful. In this classic clip from Sesame Street, we have Kermit the Frog and the Cookie Monster going head to head in an epic battle of wits. 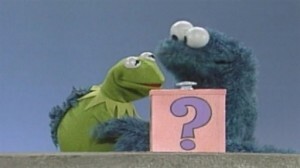 Its just hilarious that Cookie Monster can’t be trifled with Kermit’s silly guessing game if cookies aren’t involved, and to get him to stay, Kermit has to continually sell out his morals. It all ends with Cookie Monster pleading for Kermit to give him cookies, much like he is a crack head, and Kermit being so exasperated that he gives in. It’s an almost demented metaphor for drug abuse, but, hey, its the Muppets, and its spectacular. Enjoy. This entry was posted on Wednesday, April 6th, 2011 at 1:23 pm and is filed under Fun and Crazy, The Muppets, Youtube Favs. You can follow any responses to this entry through the RSS 2.0 feed. You can leave a response, or trackback from your own site. Powered by WordPress v 5.0. Page in 0.408 seconds.